One of the most commonly asked questions by drone pilots is whether or not you can fly a drone in cold weather. The answer is yes, although it does pose more of a challenge. Fortunately, we’re going to be going over some ways you can improve your cold weather flying experience. 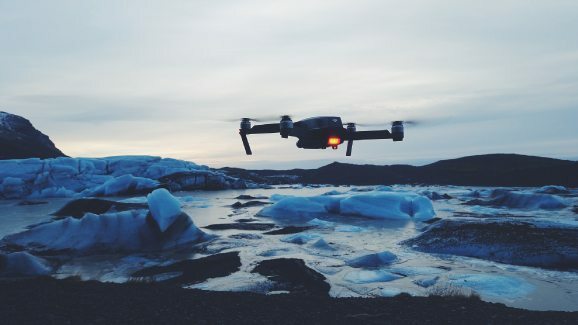 If you’re reading this article then you probably already know that flying drone in cold weather isn’t something to be taken lightly. Steps should be put in place to maximise both the safety and efficiency of your flight. Summer is behind us and winter is indeed approaching. This means for a lot of drone owners’ things are going to change. Perhaps you're even heading off to a freezing cold location and have decided to take your drone with you. If you haven't got a drone yet, check out our list of the best travel drones for a few, very portable options. 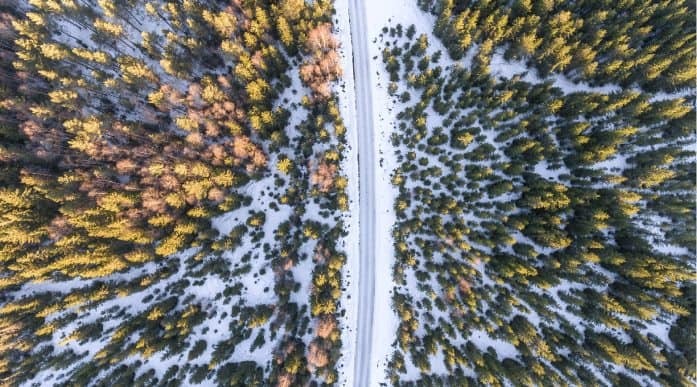 Flying in the winter periods allows drone pilots to capture beautiful snowy landscapes, however this does pose some challenges. Follow the steps mentioned in this article and you’ll be set to capture some awesome winter shots. What to Expect When Flying a Drone in Cold Weather? If you’re planning on flying in low temperatures, it is a good idea to read through the owners’ manual of your drone to see what temperatures are optimal for performance. Listed below are some popular drones optimal flight temperatures. When flying in a temperature around or below 32 °F (0 °C), the chance of experiencing issues is greatly increased. This is due to the fact that most drones use Lithium Polymer (Lipo) Batteries, which when exposed to cold weather generate less power. When I first started flying in cold weather, I would be so pre-occupied keeping my batteries and drone warm and making sure all precautions were taken that I forgot about keeping warm myself – rookie error! When your flying a drone in cold weather make sure you keep warm at all times. Wear a thick winter jacket, scarf and I would also recommend you get some touch screen gloves. You could also bring a thermos filled with coffee to keep you warm and alert. If you’re comfortable and relaxed, it will make for a much more controlled and safe flight. Fist things first, make it your priority to keep your batteries warm in order to maximise the amount of flight time that they provide. 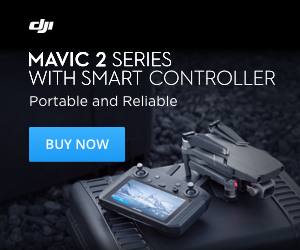 DJI recommend that their batteries are a temperature of 68° F (20° C) when flying. If you’re using an advanced quad copter such as a DJI, you can check your battery temperature using the DJI GO app. If you’re batteries aren’t warm enough to fly the app will display a warning. You will not be able to take off and will have to warm them up, so it is best that you do everything you can before hand to keep them warm. So, how do we keep the batteries warm? Well there are a number of ways you can do this. Firstly, you can put them inside a glove which you can then put in your pocket and allow your natural body heat to keep them warm. If you’re doing this, it’s best to have a big winter jacket in order to maximise warmth. Another way you can keep your batteries warm is by using hand warmers. Do not put these directly against the batteries as they let off heat. Instead, wrap your batteries in something like a scarf or a glove, and then place the hand warmers near and around the batteries. Another sneaky trick drone pilots have adopted is putting their Lipo batteries in insulated bags. Again, you could even put them inside a glove and place that inside the bag for maximum insulation. You could even put a couple of hand warms around the bag just to be safe. If you’re going to be flying in a mountainous environment you should be aware that flying at an increased altitude will mean that the propellers have to spin faster. This will cause your battery to deplete quicker and when paired with cold temperatures, you’re battery life could be dramatically reduced. As I have already mentioned, flying in cold weather will reduce your flight time. Therefore, you should never fly with your batteries only half charged. Fully charge them up 12-24 hours before you fly for maximum capacity. If you’re flying a pro-sumer grade drone such as a DJI, you can set the app to display your batteries voltage. It is very important that you do this and that you pay it close attention throughout your flight. If you’re battery goes below 3.2, volts you should land immediately. It’s best to be cautious when flying a drone in cold weather, if you’re voltage hits 3.6V, you should land your drone and swap batteries. This is an obvious one and applies to drone piloting what ever the weather. In the winter months however, the risk of moisture damaging your drone is increased. If snow is on the ground, try and take off and land on a dry surface. This could be a drone landing pad, your backpack or even the roof of your car. If you have someone who can assist you, you could ask them to receive the drone directly in their hands when you land. Other than the obvious line of site issues, flying in clouds should be avoided as well. The moisture from the cloud can get inside your drone and before you know it, it could be hurtling towards the ground – check out this YouTube video for for proof. One of the most widely practiced precautions when flying in cold weather is to hover after take off. You should do this anyway, but in cold weather this is even more important. I like to hover my drone for at least a minute, if anything were to go wrong it wouldn’t have far to fall and would sustain little to no damage. Luckily nothing has ever gone wrong, but it is best to play it safe! When flying in cold weather I like to be a bit gentler with the throttle than I normally would. That way the drone has to work less hard to get around and I feel more in control of the aircraft. I’m usually filming most of the time anyway, so slow and smooth controls make up most of the flight. Can You Fly a Drone in the Snow? This simple answer to that is yes, you technically can and it has been done many times before. However, if moisture were to get inside the drone you run a very high risk of losing the drone altogether. I personally don’t like to fly if it’s snowing, but it is up to you whether or not you want to take this risk. As you can probably tell from this article, looking after your batteries is a massive part of flying a drone in cold weather. Make sure they are warm, fully charged and keep an eye on their voltage throughout the flight. Follow the tips we’ve covered in this article and you’ll greatly reduce the risks of flying a drone in cold weather. Best of luck and happy flying! Issue is not the drone itself. It’s the cell phone battery dieing in extreme cold. Found this out at the weekend in Ottawa -5 degrees the phone battery went from 50% to nothing in 8 minutes. What’s The Difference Between ARF, BNF, PNP & RTF Drones?